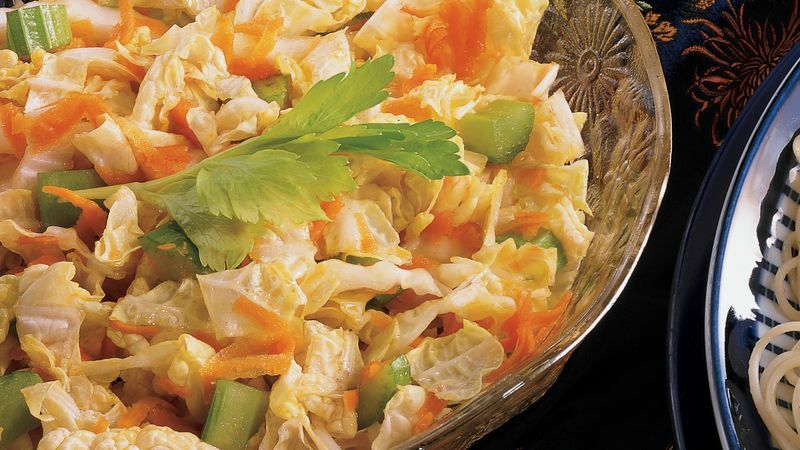 In large serving bowl, combine cabbage, carrot and celery. In small bowl, combine vinegar, sugar, oil and soy sauce; blend well. Drizzle dressing over salad; toss gently to mix. To form thin shreds of Napa cabbage, cut about 1 inch from the stem end of the head. Hold the cabbage at an angle and slice the leaves diagonally into thin shreds. Shred the cabbage and carrot, and chop the celery in advance; place them in a serving bowl and cover it tightly. Just before serving, stir together the dressing and toss it with the salad.